For the Mindroid application, two very different devices, that can serve as light glasses, are offered. Device of modern, elegant design providing the best service with its powerful diodes of 16,7 million colours. The main difference between Mindroid Glasses and the Sleep Mask is in hygienic aspect. The glasses are easy to clean and safe for use by more users, the mask can be cleaned, but not so perfectly, so we recommend it to be used only by a single person. 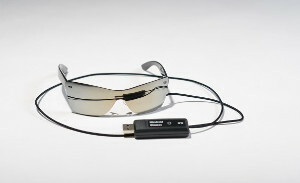 Developed primarily for the Sleep as Android app, these glasses can be used as light glasses for the Mindroid app as well. Diodes of 8 million colours. The main advantages are the multifunctionality and lower price. To use it as light glasses for Mindroid, however, you have to choose "yes" in the drop-down menu above the item price.